Samavayo are a new German band based in Berlin who play a very aggressive and groovy sort of TOOL meets stoner rock groove music. "The Heavy Song" opens the CD and here you can hear the TOOL influence, but a more aggressive approach and less interesting guitars. This music is about being heavy, emotional and very riff oriented, not jamming as guitar solos are few and far between. This is not to say it does not rock. It is easy to get sucked into this pretty cool band. Sometimes the grooves that the band get into remind me of Hermano, due to the way the singer uses his voice. The Danish band Magnified Eye is similar to this band at times. Pretty cool stuff. If you dig: Tool, Magnified Eye, Kyuss, Hermano. 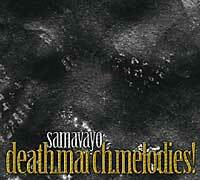 For more information you can visit the Samavayo web site at: http://www.samavayo.de.